Some containers have all the sun. These shady planters, though, are having plenty of fun sans sun. We’ve gathered all of our favorite shade-loving containers to inspire your planting this season. If you have a shady yard or want to perk up a shaded spot in your home, at your front door, on your porch, or around your patio, put together a pretty shade-loving container that’s also easy to care for. Plants like caladiums and creeping Jenny will thrive in the shade, and they’ll also add great color and movement to your planters. 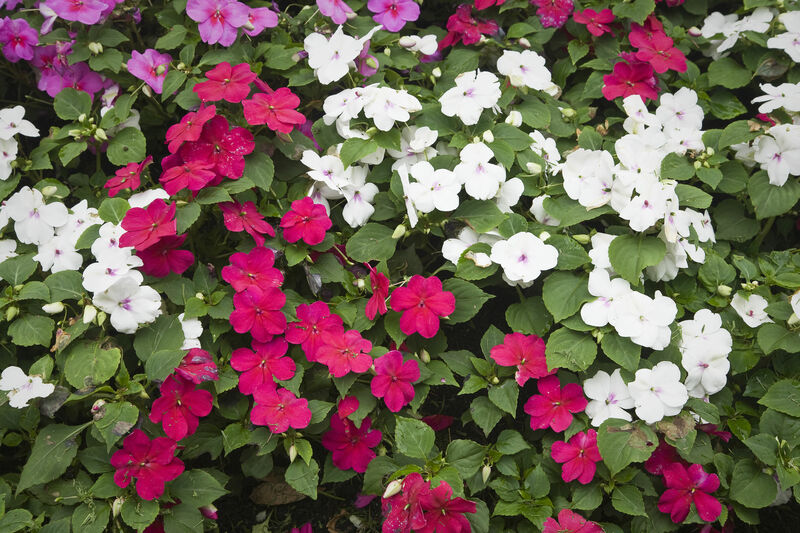 If you’re looking for the best plants for the shade and great flowers that thrive in shade, also reach for impatiens, coleus, sweet potato vines, mazus, vincas, torenias, violas, petunias, pansies, hellebores (Lenten roses), hostas, astilbes, and trilliums. They look great and will thrive in full to partial shade. Shade-loving flowers aren’t too hard to find. Ask around at your local garden store, and you’ll be able to locate the ingredients and put together any one of these shade-tolerant container ideas. Also, in regards to your container, don’t forget to think vertical. We love pots and planters, but a hanging basket is another great option, as is an elevated planter, which will make a statement and take advantage of any vertical space. Plant 'Red Giant' mustard, pansies, Littletunia series petunias, and 'Red Russian' kale for a container that will thrive in the shade. Lenten roses, or hellebores, are a great choice for a shady container. Complement pink Lenten roses with yellow acorus, lime green euphorbias, purple violas, and variegated ivy. 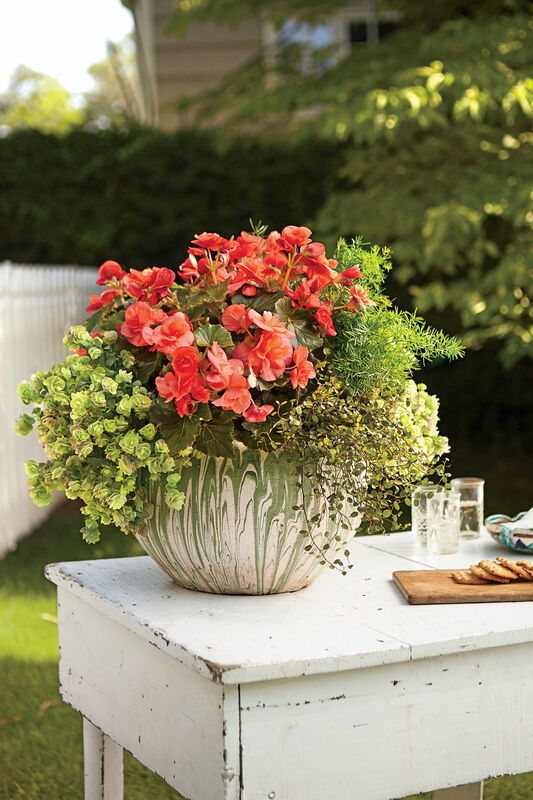 This bright container will illuminate even the shadiest of porch corners. Start with a cast-iron plant; add caladiums, impatiens, and a creeping fig for a lively arrangement. These plants will thrive together. Add coleus, verbena, fan flower, Joseph’s coat, calibrachoa, and petunias for a vibrant container, the variety of which is as fun to look at as it is easy to care for. Because these plants share similar shade and water requirements, they’ll be happy as clams in a container together. Pansies and violas are ideal choices for containers in shady spots. They’re compact and cheery, and they’ll add just the right infusion of vibrant color to a spot of shadow. Plant ‘Penny Red with Blotch’ violas in several containers and arrange them in a row for an easy vignette in an undeniably bold crimson shade. This container will thrive in part sun/part shade, and it’s a lively mix of colors and styles. Maroon Joseph’s coat, green coleus, and yellow creeping Jenny lend a vibrant touch to a container that you can move anywhere in your yard that you need a pick-me-up. This mix of ‘Ogon’ golden sweet flags, ‘Matrix Yellow Blotch’ pansies, and ‘Penny Clear Yellow’ violas add a punch of cheerful gold to your fall container style. This cheery container is a versatile one. It’s a gorgeous addition to your garden style in July, August, and September. 'Rustic Orange' coleus (Solenostemon scutellarioides), Compact Hot Coral' SunPatiens (Impatiens sp. ), 'Yellow Moon' wishbone flower (Torenia sp.) will thrive in a mix of sun and partial shade. This verdant window box gets its calling card from the spectrum of green on these lovely leaves—from pale white to chartreuse to forest greens. Plant 'Aaron' white caladium, 'Key Lime Pie' heuchera, 'White Nancy' spotted dead nettle, holly fern, ivy, and light pink periwinkle to re-create this design. This combination of violas—‘Sorbet Plum Velvet’ violas and ‘Sorbet Icy Blue’ violas—add a velvety infusion of color to a shady area. More is more. Plant one container with a single succulent selection, like this container of hens and chicks, for a snappy statement. Hens and chicks is a good succulent choice for shady spots, but it also thrives with some sun. Coleus, wire vine, euphorbia, lysimachia, and petunias combine to create a gorgeous color palette speckled with varied leaf shapes. We love the array of greens and touches of plum spilling from this container. This window box will thrive in autumn shade. Pretty, Christmas tree-shaped dwarf Alberta spruces rise from the left, right, and center areas of the box, flanked by golden, orange and green elements. Pansies, violas, kales, and a smattering of English ivy completes the design. These planters combine the best of all worlds. ‘Pandora’s Box’ violas add color at the base, while variegated English ivy contributes movement while spilling over the sides of the container. The centerpiece—which adds undeniable height—is the central evergreen, which can remain constant if you would like to change the fillers and spillers from year to year. This dainty mix makes for a rambling container that’s easy to enjoy. 'Supertunia Vista Bubblegum’ petunias take center stage with mounds of pink blossoms, which are complemented by autumn-hued coleus, ‘Diamond Frost’ euphorbias, geraniums and angelonias mixed in. This combination of red bromeliads, yellow creeping Jenny, crotons, and pitcher plants will transport you to more tropical climes, but it will also survive in the shade. We love adding the autumnal hues of the sweet potato vine and pennisetum to the vibrant waves of color provided by the pink geraniums, angelonias, and petunias in these containers. (Petunias will survive, but not always thrive, in shade. Best to alternate sun and shade with this container.) Mix and match to create your own pink paradise on your front porch. Is there anything lovelier than a overflowing, unruly planting of caladiums? They’re vibrant and their leaf structure is supremely eye-catching. We love planting different shades and varieties together for a lovely tableau that thrives in the shade. We recommend ‘Pink Symphony,’ ‘Iceberg,’ ‘Miss Muffet,’ and ‘Candyland’ to create a similar look. Embrace the blush and bashful trend with this lovely, watercolor-inspired design. Dainty 'Strawberry Sundae' twinspurs (Diascia hybrid) and ‘Penny Lavender Shades’ violas combined with ‘Red Russian’ kale add just the right statement—together, they’re graceful and pretty, but also bold and eye-catching—plus, they’ll tolerate plenty of shade. Add pots of complementary caladiums to perk up your steps. We planted pots of ‘June Bride,’ ‘Pink Gem,’ and ‘Aaron’ caladiums for vibrant, shade-tolerant containers that look great together. To re-create this container, consider height when arranging the plants. Focusing on height and structure gives this planter a distinct architecture. Ferns and ivy form the base of the arrangement, then impatiens, followed by caladiums rising from the top. 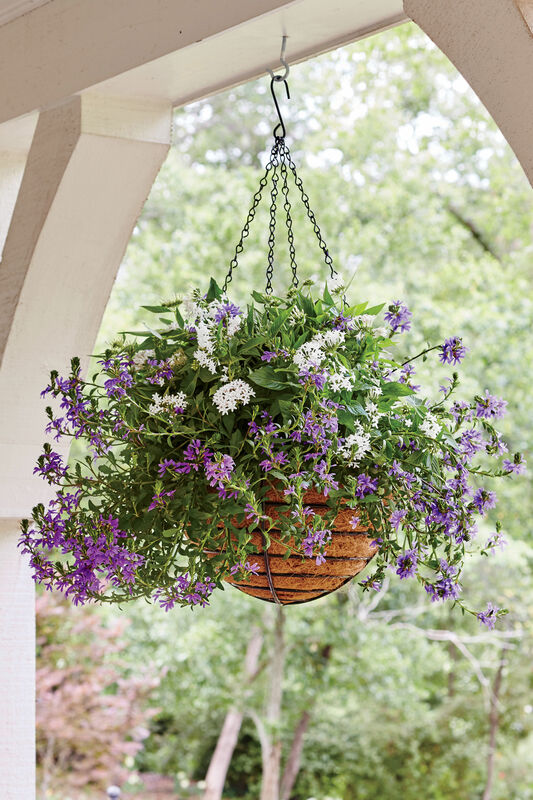 There’s a reason hanging baskets filled with ferns are a Southern porch classic. Scratch that—there are three reasons. One: They’ll survive on a shady porch. Two: They save space because they hang from the ceiling. And three: They’re just plain pretty. At home on the porch or on a tabletop, this multilevel pot combines ‘Sorbet Plum Velvet’ violas and ‘Sorbet Icy Blue’ violas for a perfectly pretty explosion of purple and lavender hues. Start with a glass vessel; add gravel, carbon, soil, and your plants. Be sure to choose terrarium plants that thrive in low sunlight, like ferns, certain succulents, and mosses. Also consider fittonia, pothos, and philodendron species for a shady terrarium. It’s easy to maintain, and oh, does it look gorgeous. This made-for-shade container garden makes its home in an elevated planter, which gives the creeping Jenny plenty of space to spill out and dangle. 'Celebration' and 'Florida Sweetheart' caladiums add vibrant color, and white wishbone flower is a lovely filler plant. Set it in the shade and water often. The color palette of this hanging planter is inspired by flickering flames and autumn sunlight. Embrace the warm side of the spectrum with yellow and orange violas and yellow, orange and red pansies planted from deepest crimson to lightest yellow shades. The shift of color and addition of varied bloom shapes and sizes keeps the arrangement eye-catching. Using whatever vessels you have on hand (we used a galvanized tub and a smaller galvanized bucket here), stack and plant your shade-tolerant picks. To re-create this look, use violas for vibrant blooms and also plant parsley as a dainty and fragrant filler. Plant more violas and creeping Jenny so that they emerge from the base and create a two-tiered effect. Take things vertical with this elegant hanging container. Impatiens, spider plant, begonias, ferns, ivy will tolerate even the shadiest of climes, and they’ll make a just-plain-lovely addition to your garden. Add an infusion of vibrant color to your patio with this combination of ‘Orange Matrix’ pansies and ‘Delta Orange with Blotch’ pansies. For added punch, we mixed in ‘Penny Orange’ violas, wheat grass, violas, and trailing English ivy. A white container is a perfect base for your shady arrangement. Plant a cast-iron plant (Aspidistra elatior), 'Moonlight' caladiums, 'Dazzler White' impatiens, silver ribbon fern, asparagus fern, Korean rock fern, and variegated creeping fig. What Does it Mean to be a Shady Gardener?